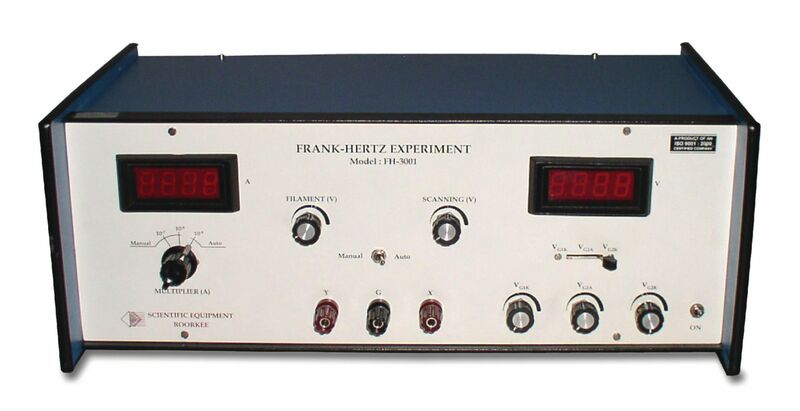 Using this unique, self-contained apparatus, students will quickly gain an appreciation of the landmark Franck-Hertz experiment, which demonstrates the existence of quantized states. The experiment can easily be performed in one lab period because of the argon filled tube used, which eliminates the need to wait for the tube to reach a proper temperature. Its compact design features all measurements on two panel meters to make setup of tube connections quick and easy. The experiment itself is also simple to conduct, as data can be plotted manually or displayed on a CRO. 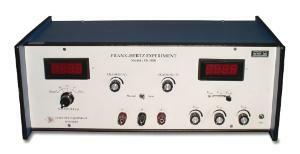 When plotting the Franck-Hertz curve manually, the anode potential is finely adjusted between 0 to 95V by a ten-turn potentiometer and displayed on one panel meter, while the anode current is monitored on a second panel meter. Seven clear minima and maxima can be plotted. An auto scan setting is also provided to allow the Franck-Hertz curve to be displayed on a CRO screen operating in X-Y mode or captured by a computer interface system. The experiment includes an argon filled tube, filament power supply(2.6–3.4V continuously variable), power supply for VG1K (1.3–5V continuously variable), power supply for VG2A (1.3–12V continuously variable), and power supply for VG2K (0–95V continuously variable). All the power supplies are highly stabilized and output voltages can be read on 3 1/2 digit, seven segment LED display. Housed in a rugged metal case, the experiment setup can withstand many years of lab use. 110V/220V; 60Hz/50Hz. Size: 58 x 32 x 26cm; weight: 18 lbs.